Armenians Insist Their Brandy Is "Cognac"
Don’t tell France, but the world’s best Cognac is flourishing in Armenia. Or, at least, that’s what the Armenians say. Yerevan, the nation’s capital, is a stark Soviet city nestled in a bowl of mountains in the shadow of Mt. Ararat. It also claims to have the most brandy factories per capita of any city in the world. Driving toward downtown from the airport, visitors are greeted by two behemoth buildings on either side of the Hrazdan river: Yerevan Brandy Company on the left, Yerevan Ararat Brandy-Wine-Vodka Factory on the right. And, like any city that houses something called “Brandy-Wine-Vodka Factory,” Yerevan doesn’t mess around. To put this brandy obsession in perspective: the most recent statistics available show that, in 2013, Armenia produced 20,284,000 liters of brandy. That same year, Armenians consumed 1,861,000 liters of brandy – or about 1.6 liters per capita. Armenia is a country that takes tremendous pride in its spirits – which constitute over 80% of all alcohol consumed here – and brandy is the national darling. Like Champagne, the official title of Cognac is reserved solely for brandies produced in the town of Cognac and the surrounding regions of Charente and Charente-Maritime. But according to Garik, back in the 1880s, Armenia began producing brandy of a staggering quality – and Cognac had some competition. A few entrepreneurial sorts, proud their superior product, entered a Cognac competition in France. You can probably guess the rest: the hoodwinked judges voted unanimously for the Armenian impostor, and conceded that Armenian brandy could henceforth claim the title of "Cognac." Much to my surprise, a large portion of Garik’s story is true. Nikolay Shustov, the then owner of the first Armenian brandy enterprise, Shustov & Sons, entered his brandy in the 1900 International Exhibition in Paris. One blind tasting and one Grand-Prix later, Shustov had won the right to legally call his product Cognac. Soon, Armenia began to produce almost 25% of the brandy made in the Soviet Union. The drink was ubiquitous at meetings of Soviet leadership – and even Winston Churchill became a lifelong fan, after he was gifted a bottle by Josef Stalin at the Yalta Conference. While the industry seemed to collapse after the fall of the USSR, production rose steadily for the next two decades. The International Center for Agribusiness Research and Education has identified the brandy industry as “one of crucial segments for economic growth and employment” in Armenia. In November, a 70-year-old bottle of Armenian brandy sold at Sotheby’s for over $120,000. But the days of Armenian Cognac may be over. And not just because of recent dips in production, including a 9% decrease in 2015. 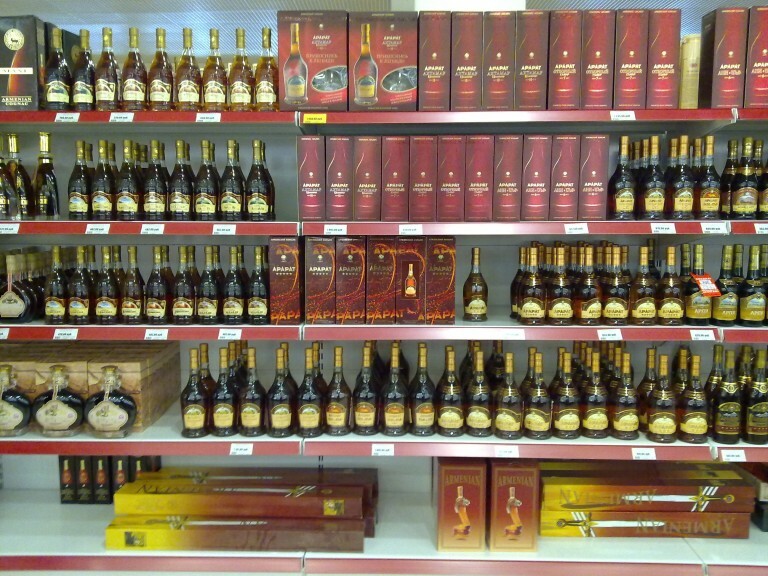 Today, you’ll only see Armenian brandy marketed as Cognac in former Soviet bloc countries. Most markets now defer to the French system of appellation d'origine contrôlée, supported by the European Union’s protected designation of origin regime. The dispute was temporarily settled in 2013, after the Armenian government unsuccessfully lobbied the EU to permit the use of the Cognac label for marketing purposes. For now, and the foreseeable future, Shustov’s Grand-Prix is a moot point; Armenian brandy is not Cognac. Still, these faux Cognacs are worth a try. My only experience seeing Armenian brandy in the U.S. is in the Los Angeles area, which might be a bit of an exception – but there is a respectable selection available, despite declining exports. There are various brands named after obscure Armenian rulers and places, but some of the major names include Noy, Arax, and of course, Ararat (owned by Pernod Ricard). I like the Ararat Akhtamar 10 year old, which has notes of smoky burnt sugar and sour fruits. The claim to the Cognac title lives on in the hearts of the Armenian people – and is permanently embedded in the language. “Kanjak” is the ubiquitous term for the Armenian drink in many post-Soviet or Soviet-occupied national tongues, including Armenian, Romanian, and Ukrainian. And we all know that language isn’t so easily changed by EU regulations and French indignation. It’s the best Cognac in the world, after all.